It's amazing that we're living in a world where you can actually say, "The Eagles really need Nelson Agholor to play in the Super Bowl." When the Philadelphia Eagles released their injury report for Super Bowl LII, they did not list a single player as even questionable, as all 53 players were expected to be good to go. On Saturday, according to Ian Rapoport, slot receiver Nelson Agholor received intravenous fluids to help him recover from flu-like symptoms. The #Eagles medical staff has done an impressive job all week as players battled flu-like symptoms. This morning, WR Nelson Agholor received IVs after feeling sick and weak, I’m told. He is already feeling better and should be fine for the game. This season Agholor had 62 catches for 768 yards and 8 TDs. 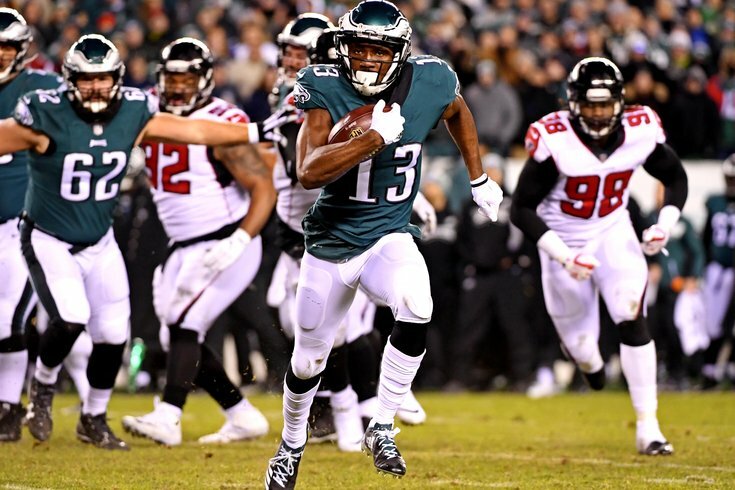 Agholor is a key player in this game, as we noted in our five matchups to watch, when the Eagles have the ball, as he presents a favorable matchup against Patriots slot corner Eric Rowe. When Rowe was still with the Eagles in Jim Schwartz's first year in 2016, he would play strictly on the outside, even when he was the team's "third cornerback" during OTAs and training camp. Rowe would come on the field, and one of the outside corners would move into the slot. And for good reason. Rowe has great size at 6'1, 205, and a fast 40 time. On a straight line, Rowe can be very fast, and his best moments with the Eagles often came when opposing offenses tested him deep. When asked to change direction in shorter areas, however, Rowe is not quick, or light on his feet. For that reason, he is not an ideal slot corner. I was taken by surprise in re-watching the Pats-Steelers game Week 15 by how much the Pats lined up Rowe in the slot. In that game, Rowe had a pass breakup on the Steelers' ill-fated fake spike that popped up in the air and was picked off by safety Duron Harmon. For that reason, he was remembered as something of a hero in that game. However, for the duration of the game prior to that play, Rowe got worked over by the Steelers' offense, mostly by JuJu Smith-Schuster and Eli Rogers. Mailbag: Who is going to win Super Bowl MVP? Because the Patriots have Stephon Gilmore and Malcolm Butler manning the outside, Rowe was forced into the slot, and outside of his comfort zone. "It was just something I had to do," Rowe explained, "because of what our situation at corner was, with Malcolm Butler, obviously he's a great player, and Stephon Gilmore, I was like 'Well, shoot, I gotta find a role on this team,' so I was like, 'Hey let me get some slot reps.' Somehow I get on the field, so..."
Saying "Somehow I get on the field" doesn't exactly sound like a lot of self-confidence. Rowe confirmed that when opposing offenses are in three wide receiver sets with a receiver in the slot, his responsibility is pretty much always the slot. The matchup of Nelson Agholor on Rowe is one that the Eagles can pretty easily generate, and subsequently exploit, as Agholor is one of the best playmakers in the Eagles' offense.